Many homes have leaky ductwork, which can cause higher bills, uneven temperatures, and air qualify problems. Do You Have Leaky Ductwork? High heating bills, rooms that are hard to heat, and extra dust around air registers can all be symptoms of the same problem: leaky ductwork in your forced air heating system. Leaky ductwork is a lot more common than most people think. In fact, most duct systems leak until they are properly sealed. A duct leakage test can diagnose duct problems, and duct sealing will fix the leaks and cut energy waste. If you suspect your ducts are leaky, we recommend hiring a Performance Tested Comfort Systems (PTCS) Certified contractor to seal your ducts. The PUD’s duct sealing rebate, which is available to customers with electric furnaces or heat pumps, helps cover the cost of duct sealing. View a complete list of PTCS Certified Contractors. If you want to check your ductwork yourself, look for completely disconnected ducts, loose connections between ducts and at bends in the ductwork, and gaps between ductwork and floor registers. 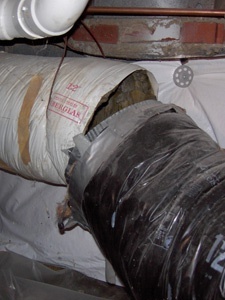 If your ductwork is insulated, dirty spots on the insulation can often indicate a leak.